Texas Teacher is published four times per year (Spring, Summer, Fall and Winter). 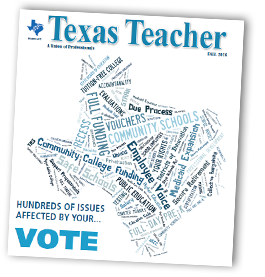 If you would like to be added to the Texas Teacher mailing list, please put “SUBSCRIBE TEXAS TEACHER” into the subject line of an email with your full name and address to Rob D’Amico and indicate if you are a member of Texas AFT (not required). If you are interested in advertising with Texas Teacher, contact Rob D’Amico.